Watch the sunrise and the sunset from all over the world or choose to follow all moon phases during a full day (24 hours). 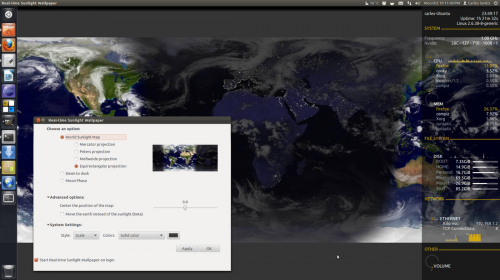 On top of that, Real-time Sunlight Wallpaper can also display computer-generated illustration of the earth’s patterns of sunlight and darkness. The clouds are updated every 3 hours with current weather satellite imagery. Because Real-time Sunlight Wallpaper is taking its information from satellites, the provided data is highly accurate. Real-time Sunlight Wallpaper is a bit more than a simple wallpaper. A simple wallpaper can only “enchant” your desktop with a beautiful image. However, Real-time Sunlight Wallpaper can offer so much more. The sunlight get updated every 30 minutes and a unique clouds display every 3 hours. Because it can track down clouds movement, Real-time Sunlight Wallpaper can prove to be a great observation tool for those who want to observe various meteorological phenomenons’ (especially huge storms, hurricanes, etc). No user responded in " Install Real-time Sunlight Wallpaper on Ubuntu Desktop "